Some kitchen tools are nice to have. They look nice, they speed up processes that usually take longer, they make cooking much easier. Things like rice cookers, bread machines, and microwave ovens are fantastic tools to have in your kitchen, but when the rubber hits the road, there are a handful of tools that are must-haves in every scenario. Here are the 5 kitchen tools you should always have on hand in your kitchen. 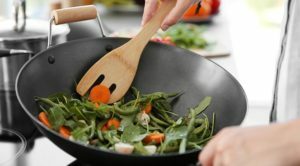 No Asian kitchen can be considered complete without it; the wok is a versatile cooking vessel that lends itself to a variety of cooking methods thanks to its unique rounded shape. Besides the obvious stir fry, pan fry, and deep fry, you can also braise, stew and even smoke with a wok! A 14 inch carbon steel wok is the perfect size for a family of 4, just be sure to properly season it before you start working with it. That’s because a well-seasoned wok will ease your cooking with its non-stick surface and add a dimension of flavour to your food. Click here to go to our guide on seasoning woks and cast iron pans. A good mortar and pestle is worth its (substantial) weight in gold. 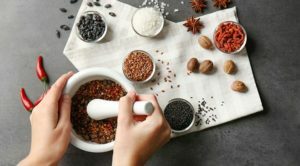 Allowing you to whip up freshly ground spices and ingredients at the drop of a hat, they are also a solid addition to kitchen décor. The best sets are usually made of polished marble or granite and carry the right balance of heft, grip and balance to make grinding easy. 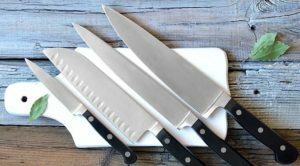 There is a vast selection of knives out there to choose from, some designed for general use and others for specialised tasks but when you boil it all down, there are two knives your kitchen absolutely needs to have. A chef’s knife is a medium sized blade and can be used for all your general chopping and slicing in the kitchen. A paring knife is the knife you reach for when you need a little finesse. 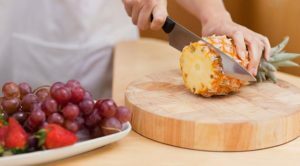 Usually 3 inches long, paring knives are used for chopping, peeling and deseeding fruits and vegetables as well as other tasks too small for a chef’s knife. Do invest in good quality knives and be sure to keep them sharp. To complement your knives, you are going to need a good cutting board. Although glass and marble can look nice, the materials you want to be considering for a cutting board are plastic, wood and bamboo. Plastic is cheap and easy to maintain, while both bamboo and wood have longer lifespans when properly taken care of. Additionally, wood and bamboo boards look great! 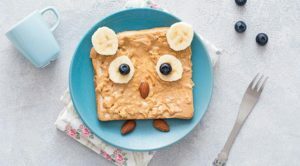 Aim to buy a board slightly bigger than you need, as you can easily cut small items on a big board, but cutting large items on an undersized board is a challenge even for the best chefs. Clichéd as it is, creativity is a huge part of what goes on in the kitchen. Cooking is a creative process, so feel free to try out new things and cook up a creation you can proudly call your own! Now that you’ve got the tools, stay tuned for our article on must-have ingredients for every kitchen.